I'm a bit bleary-eyed from a far too awake early morning of Production issues. It's my first night back on stand-by and I'm sick of it again already! Anyway. Had a fairly evolving evening last night, but it was great :) After some racy Google Talk with Varen yesterday afternoon, he popped over after work. I know we have been seeing each other quite a bit, but the spontaneous nature of it seems to work. Anyway, we watched a couple of episodes of Heroes. And then I suggested dinner at Cranks. Haven't been there in a while and it seemed like a fabulous idea :) And it was. We were sitting outside with the glow of their neon lights enjoying their fabulous Thai food and watching the pouring rain (I do love the storming weather!). And although the conversation did mostly centre round us and our relationship and the seemingly un-conventional nature of it with it's many ups and downs, the evening was perfect. And then we headed back for another episode of Heroes. I still really can't decide if I like this show, I think I'm just really watching at this point to see what happens. 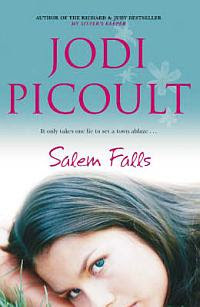 Oh, and in other news, I finished reading Jodi Picoult's Salem Falls on the weekend. I have Vanishing Acts (so-so) Mercy (also so-so) Keeping Faith (sooo-so) and Sister's Keeper (abso-f-ing-lutely fantastic! )...I keep buying her books because I hope she'll bring out another gem like that. But her hit ratio is getting pretty slim so I think I might start seeing her at the library instead. @louisa - yep, I've heard My Sister's Keeper is the bright shiny star in Jodi Picoult's library ;) Haven't read it yet, but I do plan too.